The OM-System was introduced by Olympus in 1972, more than a decade later than most of the, by then, well-established 35mm SLR brands. Its success must undoubtedly be attributed to Olympus’ chief designer Maitani Yoshihisa and his staff, certainly taking advantage of new technology and increased general 35mm SLR understanding. The nucleus of this system is the brilliantly conceived camera body of remarkably compact design, yet with one of best viewfinders in any 35mm SLR camera. The first model introduced was the all-mechanical M-1, soon renamed OM-1, with a full aperture TTL CdS exposure meter and a wide bayonet lens-mount, gradually complemented by several quite sophisticated models. The system is also associated with one of the finest ranges of optics ever made available, the OM-System Zuiko lenses, and a generous selection of accessories. The Olympus OM-system camera range fall into two main groups of bodies, the ones discussed in this article, designated by one-digit model numbers; and the two-digit models intended as lower-cost alternatives, the OM-10/20/30/40, dealt with separately. 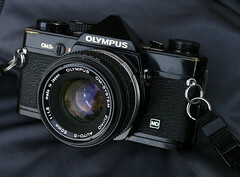 The very first model was presented at Photokina in Cologne in 1972 and was called the Olympus M-1. Thirteen years earlier, the release of the Nikon F had done much to make the 35mm SLR the standard choice for professionals and higher-spending amateurs who would previously have used Leica and other rangefinders, but it had driven the market towards heavy and bulky cameras. 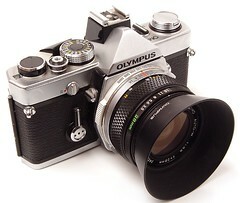 The Olympus M-1 changed this and with it began a reduction of size, weight and noise of the 35mm SLRs. It was designed by a team led by Maitani Yoshihisa, who had already created the Olympus Pen and Pen F cameras, noted for their compactness. Very soon a complaint from Leica forced Olympus to rename the M-1 to OM-1, and apart from the name the two models are identical. Today bodies and lenses with the M name are reputedly uncommon and are sought after by collectors. A rumour, usually attributed to the Olympus company, says that only 5,000 bodies were made. However research by Mark Dapoz led to an actual production estimate of 52,000. 25 examples of the M-1 were made in black finish. The OM-1 is an all-mechanical SLR. It has a very large viewfinder with interchangeable screens but a fixed prism. It also has a through-the-lens exposure meter controlling a needle visible in the viewfinder. The camera does not have automatic exposure: the user has to use the aperture and speed rings to make a correct exposure. It has a very compact body, whose form was retained in later models. Originally, oldest OM-1 bodies would not accept motor drive. The bottom cover had to be replaced (meaning a new serial number) and the md switch added to mount a motor or winder. The entire slow speed governor, along with some brass speed cams had to be replaced. Oldest OM-1 body castings required holes drilled in 2 locations. 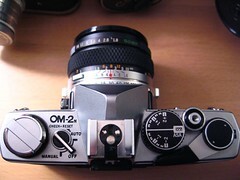 Newer "old" OM-1 might only require the addition of the md switch and new bottom cover (switch calibration required). In 1974 the OM-1MD was launched (MD standing for Motor Drive), to which a motor drive can be attached with no modification. This new version wears a small plate marked MD on the front. Oldest OM-1 MD had the MD sticker on the top cover, next to the rewind release lever. OM-2 is the automatic version of the OM-1, presented officially in 1975 at the 31st Photo Salon in Paris. An OM-2 prototype was displayed in a showcase at the 1974 Photokina in Cologne, but none of its features were announced. Externally it is nearly the same as the OM-1, but the shutter is electronic and the exposure is either automatic (aperture priority) or manual. The exposure meter of the OM-2 is able to measure the light reflected by the film (1/45th sec and longer) and compensate for any variation of light during long exposures; this is called off-the-film (OTF) metering. The exposure sensor also controls the flash exposure; this is called through-the-lens (TTL) flash automation or otf flash exposure. 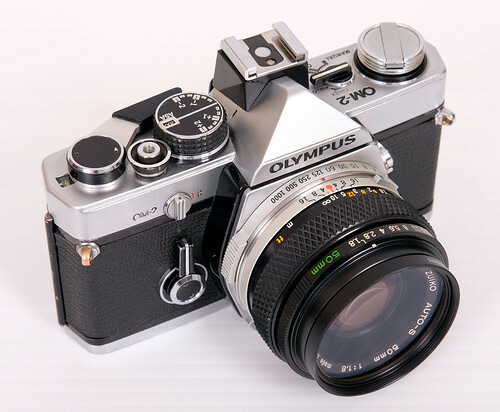 The OM-2 was the first camera to have these features (a Minolta patent licensed to Olympus). The TTL flash automation greatly simplifies flash exposure, and was quickly adopted by most other SLR camera makers, while OTF metering was also adopted by some competitors, like the Pentax LX. The Olympus Quick Auto 310 flashgun was designed for the OM-2, which unfortunately is not compatible with the T series flash units introduced in 1979 together with the new OM-1n and OM-2n. 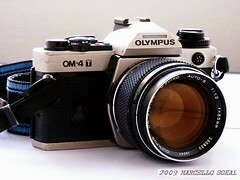 All these models existed in chrome or black, and there was also a gold version of the OM-1n. 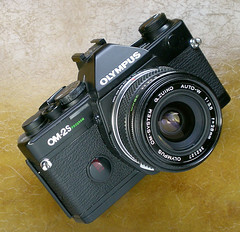 The OM-2SP was introduced in 1986, after the OM-3 and OM-4. 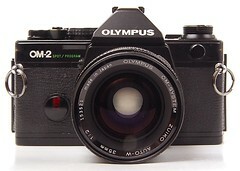 In some markets, it was called OM-2S. Although its name suggests it is a continuation of the OM-2, it has more in common with the OM-4 (and is built on the OM-4 body castings). Due to the governor built into the mirror mechanism (which is key to proper functioning of program mode), camera firing speed with either Motor Drive 1 or 2 is lowered to about 3.5 fps. programmed exposure automation (camera chooses both aperture and shutter speed), added to the aperture priority and manual modes. a spot meter for use in manual mode. a slightly modified body, with a fixed hot shoe. the ISO range is extended from 1600 to 3200.
the viewfinder indicators are LCDs. the viewfinder is illuminated via a display window or via a small lamp. the self timer has mirror prefire. The OM-2SP / OM-2S only existed in black. The OM-4 is the top-of-the-line body with shutter speeds up to 1/2000, released in 1983. The body is built on an all-new aluminum casting, with a new type of viewfinder including dioptric correction. With this camera Olympus introduced a new, versatile light-metering system. Besides the normal center-weighted metering the camera is equipped with a "Multi Spot" metering system that allows storage of up to eight measurements on a 2% central spot before making an exposure. The camera's computer electronics calculate the mean of the memorized light values to determine the optimal shutter speed. If desired, the calculated value can be retained for several exposures by using a "Memo" switch. There are also two "Hi Light" and "Shadow" buttons that are used only with spot metering. The "Hi Light" button applies an exposure correction of +2 EV, and is used when taking a spot reading on a light-tone subject for a high-key picture. The "Shadow" button applies the opposite correction of -21/3 EV to a spot reading on a dark-tone subject, to obtain a low-key picture. In addition, there is an ordinary exposure correction knob, under the rewind knob, that will work for both average and spot measures. The LCD display, visible at the bottom of the viewfinder, shows the shutter speed and the average or spot measures. It also reminds the user when any of the features described above are activated ("Spot", "Memo", "Hi Light", "Shadow" and/or exposure correction). An additional green light indicates that a dedicated flash is attached and ready for use. 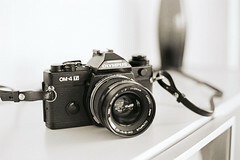 The OM-4 was released at about the same time as the Nikon FA which introduced matrix metering. The two systems were innovative, but quite different: the OM-4 provides spot measurements and does the necessary computations, but it lets the photographer determine how he wants the picture to be exposed, while the FA compares the light pattern of the picture with a databank of commonly-occurring photographic situations, allowing the photographer to work faster and even palliating his knowledge deficiencies and actually beginning to think for him. (Nikon's approach was the one that would prevail among future 35mm and digital SLRs.) Among the few cameras to have a multi-spot metering system after the OM-4 were the Hasselblad 205 FCC and the Rollei 6008, some of the most expensive medium format cameras. The OM-3, released in 1984, is a mechanical version of the OM-4, with the same metering system but with a mechanical shutter, without automatic shutter speed exposure control governed by the metering system. It has no TTL flash automation, and no self-timer. It did not sell in great quantities, and was dropped in 1986. People wanting a mechanical camera would rather choose the OM-1n, available at least until 1987, or the OM-4 if requiring the multi-spot metering system. 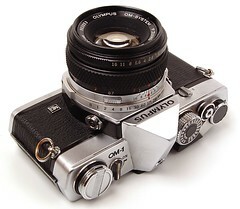 In consequence, it is scarce and the second hand asking price greatly exceeds that of the OM-4. 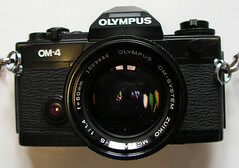 Both the OM-3 and the OM-4 were only available in black. 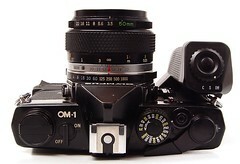 The OM-4Ti was released in 1987 and replaced the OM-4. In the United States, it is known as the 4T, while 4Ti is used for the rest of the world. In the US, when repair parts supply of 4T top covers ran out, 4Ti tops were substituted. 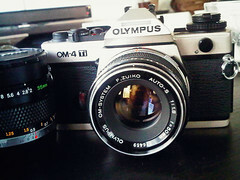 It has the same body as the OM-4 except it has titanium top cover, bottom cover and trim behind the shutter speed dial. It featured full-synchro integration with the stroboscopic F280 flash unit, allowing flash pictures beyond the X sync speed, up to a maximum of 1/2000 sec. This system was called Super FP sync, and was first featured on the OM-707. It was an answer to one of the OM's weaknesses: the low X sync speed of 1/60. The OM-4Ti was released first with a champagne finish, and later in a black finish. Production ended in 2003. The OM-3Ti, released in 1994, is an updated edition of the mechanical body OM-3 produced until 1986. It has the all-mechanical shutter of the OM-3, while its titanium top and bottom covers and some other features is from the OM-4Ti. It has TTL flash automation, itself a rare feature on a mechanical body. It also has the same high-speed flash support as the OM-4Ti. 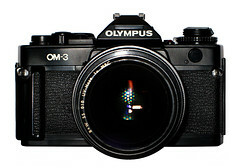 The United States distributor also sold the OM-3Ti. There was no OM-3T. The OM-3Ti is the last of the 'true' OM series (the OM-2000 followed in 1997, but it was made for Olympus by Cosina and was not a true OM system camera). During the design study of the OM-1, the Olympus design team led by Maitani Yoshihisa had worked on a completely modular camera: a 35mm equivalent of a Hasselblad, consisting of a mirror box with interchangable backs as well as finders and so forth. This extraordinary camera was built as a prototype, and was called the MDN and later the OM-X. ↑ 1.0 1.1 1.2 The name is given in the Japanese order, with family name followed by the given name. ↑ This rumour was relayed by a previous version of this very page, and might have started as a mistake on one of the Olympus official websites. ↑ Olympus OM-1 OM-2 OM-10 OM-1N OM-2N, Éditions V.M., p. 12. ↑ Maitani interview retrieved from Internet Archive The Wayback Machine - Oct, 2009 capture. Yoshihisa Maitani and the cult of Olympus at Classic Cameras by RaúlM. This page was last edited on 1 January 2019, at 18:50.